(JTA) — It was Friday evening and the cantor, wearing a leopard-print top and gladiator sandals — including one with a with a tambourine affixed to it — greeted the congregants at Shabbat services with a smile. She encouraged them to pick up the percussion instruments left on the chairs, along with the prayer books. The members, who wore sandals and shorts, happily obliged. The service that followed was a spiritual and emotional journey incorporating Appalachian banjo strumming by the rabbi, a prayer sung to Leonard Cohen’s “Hallelujah” and a brief breathing meditation led by the cantor. Welcome to the Fire Island Synagogue, a place where the laid-back attitude is seconded only by its cross-generational friendships and spiritual leadership of the highest quality. 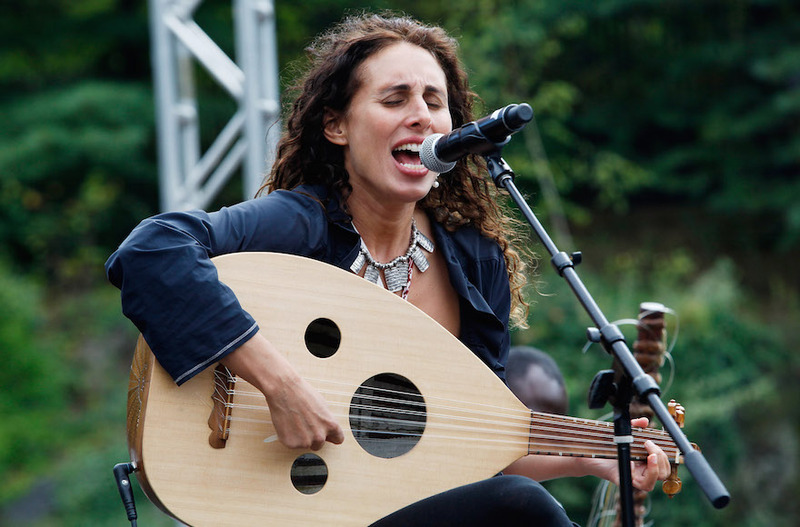 The synagogue’s summer-season community has been revitalized in recent years thanks, in part, to its dynamic cantor: Basya Schechter, best known as the lead singer of the Jewish soul band Pharaoh’s Daughter. To get to Fire Island, a barrier island off Long Island’s South Shore, you must take a train to a train to a van to a ferry — and then you walk. There are no cars allowed. You can ride a bike, but at designated times, in certain neighborhoods and only if you have a permit. Though Fire Island is only some 60 miles from Manhattan, it may as well be a world away. An almost spiritual quality suffuses the island, which at its widest stretches only three quiet, tree-shaded blocks. So it’s probably no surprise that the atmosphere at the Fire Island Synagogue mirrors the easygoing spirit of the place. During the summer months, Shabbat on Fire Island begins with Friday night services — a new institution for the synagogue since Schechter became the cantor three years ago. The synagogue’s previous cantor had been more traditional. But drumming, and the production of communal music, is a centerpiece of the job for Schechter. “It’s about finding a spot where something tribal happens, something unifying, and people can say, ‘I shared in something,’” she said. Thanks to these kinds of sentiments, Schechter was a perfect fit for the welcoming, tight-knit community. About 150 families make up the congregation. For many of them, the Fire Island Synagogue is the only congregation to which they belong; it’s the nucleus of their spiritual and communal lives. It’s where most of the families spend the High Holidays and where their children celebrate their bar/bat mitzvahs. Like the Fire Island community at large, many members of the synagogue have been summering on the island for generations. “It’s always such a good feeling that first weekend you’re back and everyone’s there,” said Lisa Alter, a thin woman with straight, dirty blond hair who comes to Fire Island every summer. Her mother, Deborah Alter, whose blond hair is now white, had her first date with Lisa’s father on Fire Island in the 1950s. They borrowed a boat from a relative in Brooklyn and took it all the way to Maguire’s, a restaurant at Fire Island’s Ocean Beach community that’s still around today. They bought a house on the island soon after they were married. At that time, novelist Herman Wouk was living on Fire Island, as was Rabbi David de Sola Pool of the Spanish-Portuguese Synagogue in New York City. In 1954, they started holding traditional Shabbat services on Wouk’s deck and the Fire Island Synagogue was born. In 1972, the congregation built its current building, a beautiful, single-story wooden structure surrounded by lush foliage and a shady deck. The congregation ranged from Orthodox to secular. There was no partition, but women were not included in the service. In 1990 — a time when the congregation struggled to make a minyan — members gathered to vote on whether to become egalitarian. A debate ensued — Alter held up her 6-month-old-daughter and made an impassioned speech about wanting her to have rights — and votes were cast. The Fire Island Synagogue’s rabbi, Shaul Magid, has been serving the community for 18 years. In his other life, he is a professor of Jewish studies at Indiana University specializing in Hasidism, Kabbalah, gender and Israel/Palestine. The professor and the rabbi are complementary roles for Magid, who brings an academic rigor to the spiritual duties of leading a congregation. At a recent Friday night service, Schechter, hair still wet from a dip in the ocean, and Magid, tall and lean, dressed in white, sat side by side at the front of the synagogue. The authority granted the rabbi by his thick gray beard was somewhat undercut by his smiling eyes and the earrings adorning his earlobes — two small hoops and a turquoise stud. Two years ago, Magid and Schechter became a couple, adding another dimension to the partnership. Their unique combination means that the Fire Island Synagogue, in spite of its out-of the way location, offers its congregants and visitors some of the best programming the Jewish world has to offer in both music and thought. Magid has been through his own spiritual evolution over the years. Growing up secular in counterculture New York in the 1970s, he spent 10 years in Israel living a haredi Orthodox life. He left the community to pursue academia in the United States and the Jewish Renewal movement. In terms of navigating his two jobs, Magid explained that there’s a difference between teaching and preaching. In addition to Shabbat services, Schechter and Magid offer less religious programming, drawing in a uniquely diverse crowd. On Saturday night, Schechter transformed the synagogue into a cafe (with round tables, tea lights and wine) for a singer-songwriter event. Seventy people came, though it felt more like a family reunion than a showcase. One of the singers forgot the words to her first song, and the people she grew up with pulled out their phones and looked up the words for her. But the most surprising event occurred Sunday morning during “Breakfast With the Rabbi,” which happens two or three times a summer. A group of Jews across three generations came together on the synagogue’s porch over bagels and lox, and with Magid’s careful and generous guidance, politely and productively argued about Israel. Far from descending into angry disagreement or emotional appeals, Magid managed to get all the parties to finally agree — or, at least, pleasantly agree to disagree. It seemed the kind of thing that could only happen in a fantasy of Jewish paradise, which is, of course, exactly what Fire Island is.